The RV had barely come to a complete stop when my boys jumped out exclaiming, “Is it really made all out of Lego? There the boys stood, inspecting a life-size cowboy riding a horse. As they reached up and touched the horse’s legs, their amazement was only just beginning. 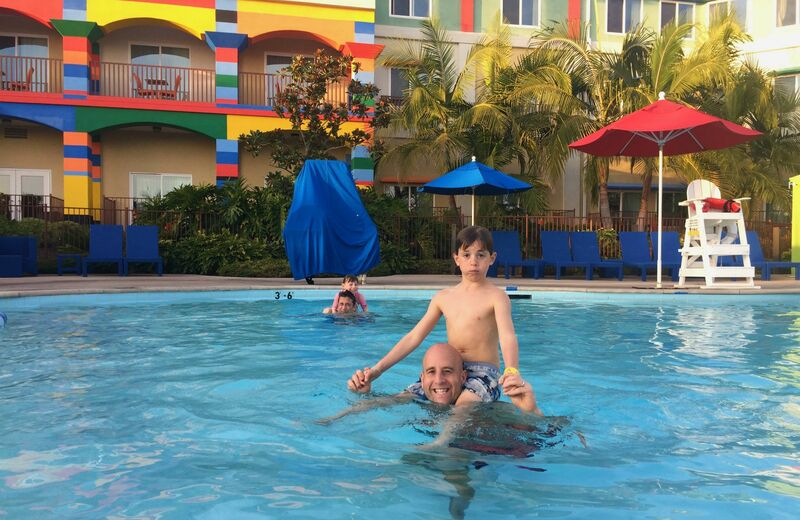 We quickly learned why staying at the Legoland Hotel the night before venturing into the park proved to be a perfect choice for our family. 1. 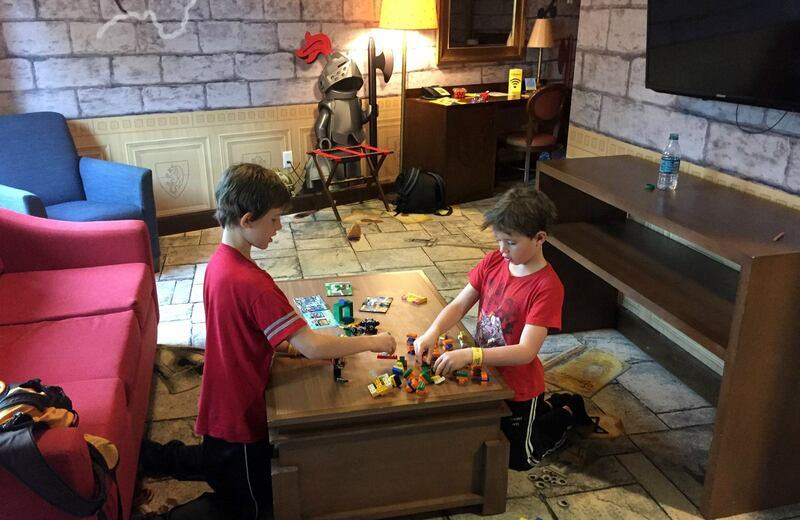 Legoland hotel is designed for kids! Even the hotel room door has a spy hole just at kid height. 2. Everything is made out of Lego! Pictures, statues, art, play structures…it’s all Lego. 3. 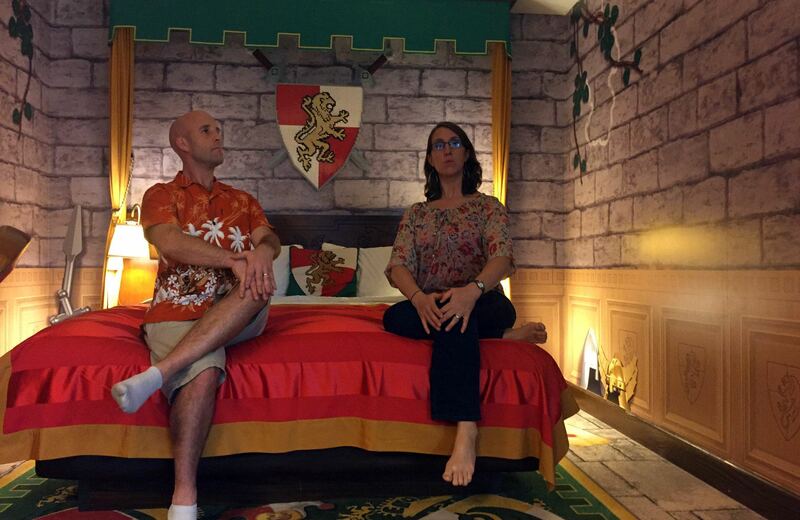 Theme rooms throughout Legoland hotel! Every room is special. We chose the Kingdom Theme and it felt like we were in a castle. My 7 year old made his bed for perhaps the first time in his life because he loved it so much. He would have even taken the pillow home if we allowed him. 4. Treasure hunt for the kids upon arrival with real prizes in the room. Trust me, your kids will love coding in their numbers on the safe in the room to see what is inside. 5. Lego bricks everywhere to play with…literally! The lobby, the room, the restaurant, and even the pool. 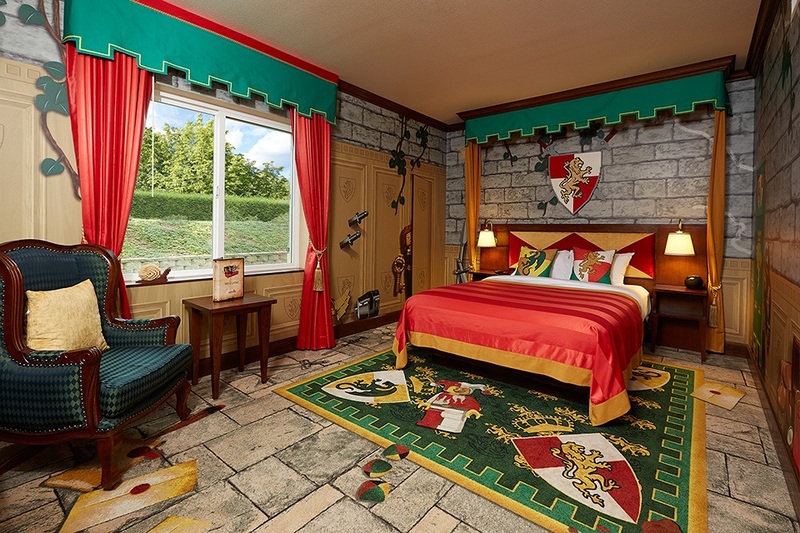 Your kids are guaranteed to go nuts over the Legoland hotel. 6. Legoland hotel bathroom in the lobby even has characters that talk to kids, reminding them to wash their hands. 7. The best ever breakfast buffet! Seriously. We had such an assortment of delicious food in the morning that not a single one of us was hungry until 1:00 in the afternoon. Usually we were ready for snacks around 10:30am, but not after such an awesome breakfast. Be sure to factor in the free breakfast perk as part of your stay when looking at the overall Legoland hotel price. 8. Over-the-top friendly staff. I’m sure there’s an award somewhere out there just for the Legoland staff. Whether we were sitting in the restaurant waiting for our meal or simply walking down the hallway, the staff were amazing and engaged with the kids at every turn. 9. Your kids will have more fun riding the elevator than ever before….serious 20 second dance party! Check out the video below to see it to believe it. It was quite the surprise the first time! 10. 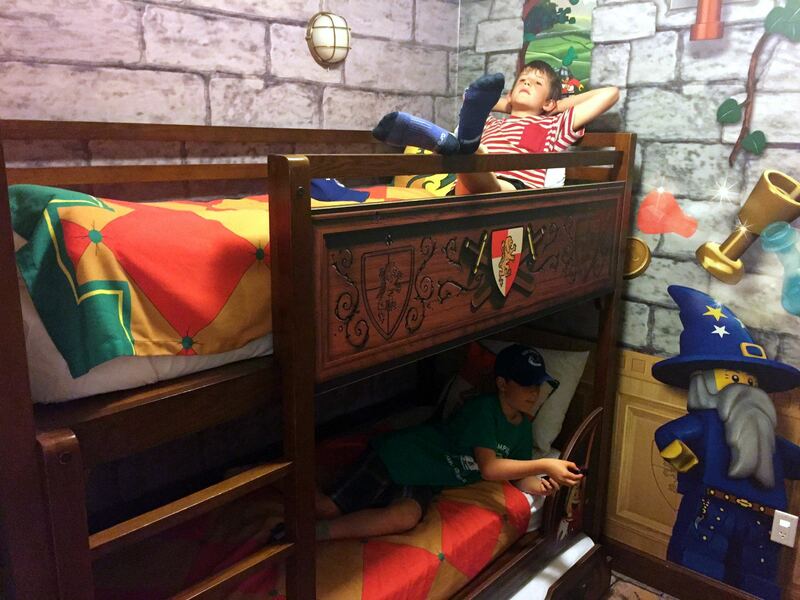 Staying at Legoland hotel made us even more ready for the park itself. We were completely in the lego mindset before crossing the line into the park. It built the anticipation for our day of adventuring. Legoland hotel guests get a special bracelet for early entry too. 11. BONUS – Mini figure lego trading. This was definitely a highlight for the kids. Any Legoland Hotel staff member with a mini figure on their name tag meant they were up for trading. Kids were constantly on the lookout for characters they really wanted. After a night in the exceptionally special Legoland Hotel, we were ready for a day in Legoland Park. We found our kids to be at the perfect ages, 7, 9 and 10, to fully enjoy everything that the park offered. Of course the Star Wars scenes captured my 9 year old and he spent the better part of an hour just gazing at each “planet” straight from the movie. I won’t lie, it was hard to peel the boys away from this area, but the rides continued to call my daughter, so away we went to spin and roller coaster away to pure theme park bliss. Legoland had something for each of us, but mostly I just savoured the moments of our kids enjoying every second of their day. Plenty of space to create and build, rides to keep their little heart pumping, and scenes for the imagination. And just like Legoland Hotel, everything in the park is made out of lego too. Our kids still talk about how great Legoland is. It was a grand day and one we won’t soon forget. Christmas in Legoland brings out even more magic! We visited the second week in December mid-week and we couldn’t believe how few people there were.